If you have a L.O.L. Surprise Doll or Num Noms fan you may want to head to Toys R Us today from 1pm to 3pm for a Trading Event! They will also give everyone an exclusive L.O.L. Surprise keychain and a Num Noms activity book. View more details HERE. Take the family out this year for some fun Halloween events, carnivals and trick-or-treating around DFW! Tons of your favorite businesses host Halloween celebrations that you won’t want to miss. Let the kids show off their costumes, and enjoy some spooky Halloween events as a family. And don’t forget to check out our lists of Pumpkin Patches & Corn Mazes, plus Haunted Houses in Dallas and Fort Worth with discounts! Join Watters Creek at Montgomery Farm on Saturday, Oct. 22 for fun-filled, Halloween-themed activities and entertainment for the whole family. The center’s Halloween festivities kick off at noon with Bach & Broomsticks, which includes kid-friendly activities and family fun until 4 p.m. Concerts by the Creek from 7 – 9 p.m. featuring Bach Suites and Two Feet Beats wraps up the day’s events with a fusion of Bach and Gershwin in an eclectic and vibrant performance. Internationally Acclaimed Autumn at the Arboretum Fall Festival Returns with 90,000 Pumpkins, Gourds and Squash. More than 90,000 pumpkins are sprouting in the Texas Panhandle this month, on their way to being featured in this year’s Autumn at the Arboretum national fall festival, made possible by Alliance Data and Texas Instruments. 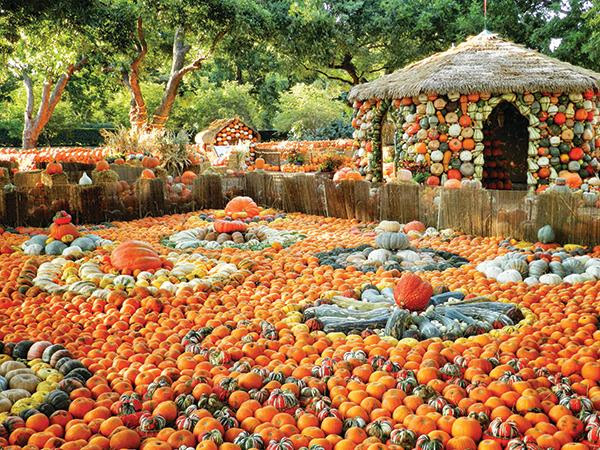 Named one of “America’s Best Pumpkin Festivals” by Fodor’s Travel and “One of the World’s 15 Most Breathtaking Gardens” by Architectural Digest, this year’s event at the Dallas Arboretum and Botanical Garden will highlight the “Art of the Pumpkin,” September 17 to November 23. For the 11th year, Autumn at the Arboretum will include the popular one-acre Pumpkin Village in the Pecan Grove, featuring artful arrangements of tens of thousands of pumpkins, gourds, squash, bales of hay and cornstalks. They will be used together to create pumpkin houses that represent naturally occurring patterns in nature to mirror the “Art of the Pumpkin” theme. Cinderella’s Pumpkin Carriage will also return, courtesy of Baylor Scott & White Medical Center at White Rock, set amidst the garden’s remaining summer flowers, as well as 150,000 fall blooms like chrysanthemums, ornamental grasses, copper plants and firebush, and will be open daily from 9 a.m. to 5 p.m. The popular Haybale Maze will also return with the Tom Thumb Pumpkin Patch offering pumpkins for purchase, and the Great Pumpkin Search. Oct. 15 – 16, 22 – 23, and 29 – 30, 1 – 2 p.m.
Stop by the Pecan Grove to enjoy the Art of the Pumpkin. Free pumpkins will be available, while supplies last, for guests to decorate at a painting table in a wide range of colors. Come enjoy trick or treating in the Pumpkin Village. Additionally, families can enjoy face-painting, Kindermusik and a petting zoo in the Pecan Grove from 10 a.m. to 2 p.m. Guests are encouraged to bring their own trick or treating bags. Wear your costumes to the Children’s Adventure Garden and meet our staff to discover the spooky-side of nature. Only the best ghouls and ghosts can collect all of the stickers. Saturday, October 29 – Monday, October 21, 4 p.m. Enter the maze if you dare, because around each corner, there might be a scare. Don’t get lost in the haze as you make your way through the maze…in the Amazing Secret Garden. Buy one get one free general admission, which includes Nature Nights (through October 19), is available at the ticket booth, with a limit of one purchase per person. Fort Worth Zoo prepares spellbinding fun and entertainment for annual Halloween event. Boo at the Zoo for one weekend only on Oct. 28, 29 and 30, from 10 a.m. to 5 p.m. The family-friendly event will offer entertainment throughout the entire Zoo and plenty of treats to satisfy any sweet tooth. This year’s Boo at the Zoo, presented by Central Market, will offer treat stations and Halloween-themed entertainment throughout the Zoo. In addition to trick-or-treating, guests of all ages will enjoy a live animal stage show at the Outdoor Learning Theater, a kids’ craft zone, carnival games, musical entertainment, stage shows and a day packed with Wild Encounter keeper chats. Zoo guests and members will receive six Boo at the Zoo coupons at the Zoo’s main ticket booth at no additional cost. Coupons can be redeemed at treat stations throughout the entire park. Additional coupons are available for purchase. The community is invited to submit decorated pumpkins for the Boo at the Zoo pumpkin patch. Participants of all ages can transform a pumpkin into works of art using paint, stencils, accessories – whatever they can conceptualize and create. Pumpkins selected by the Zoo’s panel of judges will be featured at the event alongside creations from Zoo staff and local celebrities. Boo at the Zoo is free with admission—$14 for adults, $10 for children ages 3 to 12, $10 for seniors ages 65 and older, and free for children 2 and younger. The event is free for Zoo members. This is one of DFW’s most popular Halloween events. Join us for free activities, bounce house, food truck, pumpkin carving contest, costume contest, and craft fair. Saturday, October 15th 3-6pm. This event is FREE! Bass Pro Shop is offering up some serious fun from October 24-31st. Monday – Friday from 6-8pm, Saturday and Sunday from noon-5pm, and Halloween from 4-8pm, there will be TONS of great things for the kids to do. Get a $5 Photo pack ($10 value) with the coupon on this page (one 5×7, four wallets and a digital download. Plus, every kid that takes a photo gets a FREE kids’ entree at Bass Pro locations with restaurants. As far as Halloween events go, this is a great one! Your favorite halloween activities return with Brick or Treat! Bring your ‘lil pumpkin to our Fall Carnival event. There will be fun Carnival games with prizes, plus crafts, Spin The Wheel, Make Your Own Yogurt creation & more. Kids can dress in costume and strike a pose in our fun photo backdrop. We will distribute candy and other prizes at the Carnival stations. There will not be an organized Trick-or-Treat event on October 31 this year due to low retailer participation. Halloween parade! Let the kiddos show off their fun costumes with Pottery Barn’s parade! Activities and treats from Annie’s will be offered, too. Even tis Saturday October 8th at 3pm. Tricks, Treats, and Targets children’s event on October 29th for the first 200 kids until 11am.There will be a face painter, balloon twister, halloween games, and a costume contest. Visit your local Williams-Sonoma on Saturday, October 8th at 10am for a Haunted House Decorating, suitable for ages 5-13. In this class you’ll assemble a spooky gingerbread mansion and decorate it as you please. Explore The Colony Shoreline Trail after dark with a guided Owl & Howl Prowl from 6:30pm-7:30pm on Tuesday, October 27th! You’ll see wildlife, and learn about nocturnal animals. The walk is about 1-2 miles round trip. Get more information by emailing: ibrowder@thecolonytx.gov. You won’t want to miss this year’s Fall Festival at the Plaza. This year’s event will feature a six-pony carousel, a longhorn photo-op, face painters, carnival games, hay rides, a petting zoo, arts & crafts by Kiddie Academy, a pumpkin patch station, and much more! A DJ will keep everyone entertained with the hits of yesterday and today. Two $100 gift cards will be given away, so don’t forget to stop by the registration table. Also available will be free candy apples for the first 100 people and food for purchase. Pumpkins will also be on sale. The Kiwanis Haunted House will open at 4 pm and will be $5 for everyone. Also, the 6th Annual Progressive Beer Tasting will begin at 5:00 p.m. Participating merchants will offer free beer tasting. *Must be 21 or older for beer tasting. Valid ID required. Participating shops will be identifiable by a neon orange flyer in the window. Halloween is here and Grapevine Mills is inviting all little ghouls, goblins and boo’tiful princesses to come have a spooktacular time at the Kidgits Halloween event, located at Entry 4. To add to the fun of these Halloween events, Twentieth Century Fox is also celebrating the Blu-Ray and DVD release of The Croods, Monsters vs. Aliens: Cloning Around, DreamWorks Dragons: Riders of Berk Part 1 and Part 2 and Kung Fu Panda: Legends of Awesomeness. You won’t want to miss all of the fun activities and giveaways! Join us afterwards for trick-or-treating around the mall! Trick-or-treating begins at 6:00 pm. On Halloween day, download a list of photo challenges from the Southlake Library website, start your hunt for the required items, take the photo and upload to Instagram using the #SPLHalloween. This is pretty unique, as far as Halloween events go! Complete the tasks to enter to win cool prizes. We’ll be watching! Bring your family for a fun time at Halloween HullabaBOO! In addition to trunk or treat, a cupcake walk, games and a bounce house, the children will enjoy a performance by an illusionist. New this year is a chili cook-off for adults. This wildly-popular event features Trick-or-Treat stations, game booths, stage entertainment, great food, and the one-of-a-kind Haunted Hedge. Check back soon for additional info. Safari Run, Plano’s fitness-based entertainment center for children, will host a series of Halloween events from October 28 through October 31, including a special Parents’ Night Out on October 28. Admission is only $10 per child and includes games, raffle prizes, trick-or-treating and Open Play time, which includes big mazes, zip lines, climbing tunnels, giant slides, a running track, an arcade, a separate toddler area and a parent’s lounge with free WiFi. Parents/guardians are always free at Safari Run! Saturday, Oct. 29 from 4:30 p.m. – 8 p.m.
Sunday, Oct. 30 from 3:30 p.m. – 8 p.m.
Monday, Oct. 31 from 10 a.m. – 3 p.m.
Bring THIS FLYER for $1 off admission! Area kids invited for a wicked good time! WHO: Calling all ghouls and goblins! Children under 12 are invited to join Grand Prairie Premium Outlets for a Halloween Trick or Treat event from 4 – 9 p.m. on Monday, October 31. Families can enjoy collecting treats from participating retailers throughout the center for a safe and fun Halloween event*. Participants will begin their adventure at Guest Services to pick up their first treats of the afternoon. Don’t forget to sign up for a complementary VIP Savings Passport while you’re there which treats shoppers to additional savings at over 70 stores at Grand Prairie Premium Outlets! Participating retailers will have candy & treats for little ones and pumpkin signage in their windows. Come join us for a spooktacular event! What Halloween Events in Dallas will you attend!? Welcome to our new series, “My Dallas Mommy’s Top 10”! Each week, we’ll highlight a top 10 list of our favorite things! Explore Dallas with a treasure hunt from Downtown Dallas, Inc. Downtown Dallas, Inc. sponsors a fun lunchtime hunt on Mondays and Wednesdays. Pop over to Belo Garden a 11am for clues to get you started. You’ll take pictures of each place the clues lead you to, and post them on social media. You’ll be directed to shops, parks, landmarks and more. Once you’ve completed the tasks, go back to the Garden. The first one to finish receives a prize, and all who participate get goodies! Get cultured, stimulated and educated for FREE at several Dallas museums! The Dallas Museum of Art is one of the hallmarks of the city. It features over 22,000 art pieces, too! You can also see The Samurai Collection at The Ann & Gabriel Barbier-Mueller Museum. The Meadows Museum of Art features a HUGE collection of Spanish art. And the African American Museum offers tons of history and pride. Check them all out for free admission! Uptown Dallas, you’ll find Reverchon Park. It features tennis courts, baseball fields, hiking trails, garden area, a volleyball court and much more. It covers 41.3 acres, and a TON of possibilities for activities. It’s not quite as popular as other parks in Dallas, but it’s just as wonderful, and less crowded, too. What better way to tour Dallas (or get around, if you’re local), then a classic trolley!? The trolleys – Rosie, Matilda, Petunia, Miss Daisy and Green Dragon – are restored, vintage trolley cars. They ramble along Dallas’ original trolley tracks through downtown. Temperature-controlled, 100 year old trolleys. We’re in! Ride are always FREE, and the service runs 365 days a year! Stop over here to see the route map and schedule. As part of the Parks Concerts series, the Dallas Symphony Orchestra offers FREE concerts! As they move around various parks in Dallas, the orchestra sets up a casual, family friendly environment. Bring a blanket and lounge in the sun, while listening to amazing classical live music for free! See the website for locations and schedule. Shakespeare in the Park might not be “free,” but it sure is worth it! Tuesday, Wednesday, Thursday and Sunday night performances ask for a donation to attend. Performances are in the amphitheater at the Samuell Grand Park. Wilt thou partake in a festival of thespian culture? 😉 Check the website for details about play schedules. Monday through Sunday from 10am until 6pm, take a stroll through the Dallas Farmer’s Market. This 26,000 square foot food hall and artisanal vendor market also features more than just market fresh foods. There are four restaurants, and seating areas inside and out. Score some free samples from vendors, and relax while enjoying the Dallas skyline! Dallas Farmer’s Market is located at 920 South Harwood Street. Every Saturday, Four Corners Brewing offers tours of their industrial-style, yet trendy brewery. Three guys started making beer out of their garage, and it blossomed into a hot spot in Dallas. Learn all about how beer is made, what inspires the flavors of Four Corners brews, and get some free samples, too! Find Four Corners Brewing just west of downtown at 423 Singleton Blvd. Tuesday nights are open mic night. That means you can try your luck at some stand-up comedy, or watch other funny people on stage for FREE! If stand-up isn’t your forte, consider the free Improv Comedy Jam Session on the same night. Located in the heart of Deep Ellum, the Dallas Comedy house is located on Main Street. Sundown at the Granada Theater offers everything you could need for a cheap date night, or girl’s night out. Get free entertainment with live bands throughout the week, and drink specials like 1/2 off bottles of wine and 1/2 price draft beer. Cuddle up on the roof and watch a movie with your date for free on Wednesdays, too. Even better, Wednesdays offer 1/2 price whiskey! Visit the Granada at 3502 Greenville Ave. This is number 1 on our list of free things to do in Dallas, because it’s unique, a little nostalgic, and makes for great memories. There you go! These are our top 10 favorite free things to do in Dallas! What would you add to the list? Let us know in the comments about your favorite free event or activity! Have a little extra wiggle room in your budget!? Be sure to go here to checkout discounted ticket prices for events in Dallas and Fort Worth! Also, keep in mind that Groupon and LivingSocial always have great deals on local shops, restaurants, spas and more. GoldStar also offers half-priced entertainment! Other ways to save going out, try Pogo Pass or City Pass! Do you need a night out? Get your giggle going at Hyena’s Comedy Nightclub in Fort Worth on Wednesday, August 17th! You’ll be able to score FREE tickets when you go to laughslive.com and use the promo code LAUGHS at checkout. Grab your tickets now, before they are gone, as there are a limited number available for free. Dallas comedians Aaron Aryanpur will be there – he was named the “Funniest Comic in Texas” in 2012. Other big names that will be performing are CJ Starr, Lashonda Lester, Josh Johnson and Jay Whitecotton. Plus, there will be many more comedians performing. Get your tickets HERE and get ready to plan a night of laughter and fun in Fort Worth! Pokémon Go in Dallas and Fort Worth! The Pokémon Go craze has hit new levels. When is the last time my daughter wanted to hop in the car with me and drive endless miles and explore the city spending no money, but gas? Ugh like, NEVER!!!! Love it or hate it, Pokémon Go is the rage right now. Dallas and Forth Worth businesses and attractions are getting on the Pokémon Go bandwagon and offering deals, discounts and just plain fun. Below is a list of Pokémon Go Pokéstops along with deals and discounts in Dallas-Fort Worth! I’ve also shared ways to save if you’re wanting to visit a local attraction to for hot Pokéstops! Feel free to leave comments about any deals you find and I will share with our readers. Read our DFW Summer Staycation Guide for TONS of great places that are sure to be Pokestops for FREE! Pogo Pass . It’s a year long, family based entertainment pass, that gets pass holders into some of the best venues in Dallas that are great for Pokestops! Head over here and use code MYDFWMOMMY and get 60% off (you’ll pay $49.98 instead of $124.95). Just Hawaiian Falls and the Fort Worth Zoo are over $40 by themselves! CityPASS? is a booklet of admission tickets to the best attractions in a single city including Perot Museum, Reunion Tower, Dallas Zoo + more. Also check Groupon, Living Social, and Ad Pages. GameStop: Select GameStop locations around the DFW are now Pokéstops and gyms! Go HERE to find one near you. Brookstone: Stop by your local Brookstone store and score $5 off your purchase when you show your Pokemon Go App to the cashier at checkout. For more information, visit the Brookstone Facebook page. Sams Club: Sam’s Club is offering Pokemon Go players a free day pass to shop in its stores — and a free cookie to boot. Just head to your local store and show your phone to an associate — with the app installed, of course. The Shops at Legacy: The Shops @ Legacy! Huge spread of pokestops, lots of people this weekend (so lots of lures). There’s a Marriott on the south side of the area with a pond where we caught several psyducks. Addison Circle Pavillion: Pogue Entertainment Group & Studio 7 Presents Pokémon Go Benefit Festival August 28th from 6-9pm. There will be $5 raffles for Pokémon Go merchandise, game coins and special items. Free lures, live entertainment and food trucks are just more reasons to attend this great event! All raffle proceeds go to benefit “Hearts of Maya” scholarship fund. Ann and Gabriel Barbier-Mueller Museum: Family Day is the first Saturday of every month. August 6th, they are featuring some neat information about samurai counterparts to your favorite Pokémon characters. This takes place between 1-3pm. There will even be prizes to trainers who catch Pokémon in the museum! Pub Crawl: August 10th, High and Tight’s themed pub crawl is… you guessed it, Pokémon Go! Be sure to check out High and Tight, Twilite Lounge, Brick and Bones and Wits End for Pokéstops. There will even be drink specials! Get more information on their Facebook Page. Thunderbird Roller Rink: August 12th is PokeSkate: A Pokémon Party! Tickets can be purchased HERE, and need to be purchased in advance. They are $7 per person (2 and older). Skate rentals are an extra $2, but you can bring your own. Skating is not required. They will have charging stations for phones and free WiFi. Also included is fun 90’s music to skate to, prizes, games and more. Klyde Warren Park: Pokéwalk Dallas will be from 4-9pm on August 27th. A pub crawl will finish out the night, for those left playing. This is a great way to meet some new Pokémon trainer friends! Arlington Visitors Welcome Center: Stop by our Pokéstop in our Visitors Welcome Center, there might be an egg (we know we keep getting three poké balls every few minutes woo)! If you sign their guestbook,you’ll get a FREE APPETIZER coupon for Mellow Mushroom Pizza, which is also a Pokéstop! Trinity River Audubon: Get some walking in with hiking trails! There are 3 Pokéstops at the Trinity River Audubon, plus exhibit halls and more. It’s only $1 for admission. Be sure you stay on the trails while hunting! This deal is good for the entire month of August. Get more information HERE. Arlington: For a HUGE list of great spots in Arlington, go here! AT&T Stadium: it has THREE GYMS!!! Outside of AT&T Stadium, there is a Pokéstop or two. Then take a tour of the stadium to obtain the stops inside! Dallas Arboretum and Botanical Garden Dollar Days in August at the Arboretum offer some great fun! Get admission for just $1. Parking is only $5. And, $1 per person, check out the 8-acre Children’s Adventure Garden, too. Pokémon players can enjoy over 30 Pokéstops and 3 gyms within a 66-acre area! Dallas Zoo: The Dallas Zoo welcomes all Pokémon trainers. We want you to have a fun and especially safe time while looking for the elusive Pikachu or fighting to take over the giraffe statue gym for Team Mystic. Save using City Pass! Putt-Putt: All Tarrant County Putt-Putt locations (Fort Worth, Hurst and Arlington) are offering $2 off a game of golf when mentioning Pokemon Go. The offer cannot be combined with other discounts. Ripley’s Believe it or Not! has two Pokéstops and a gym! Six Flags Over Texas – there are three gyms and 26 stops. Texas Rangers Games: There are THREE in Globe Life Park + 2 gyms! Check out our Ways to Save at Texas Rangers games here! Globe Life Park is a Pokéstop in itself, you can take a tour of Globe Life Park or attend a game there to get the two (or more) lurking inside. The Nolan Ryan Statue is a Pokéstop, and there’s also a mysterious “Classic Texas Rangers” Pokéstop. Check out Meetup.com for the Pokémon Go Club meet up schedule. You’ll be able to meet other locals and hunt together! Heads up all you Pokemon Go fans! Amazon offers downloads of Pokémon Go: The Ultimate Hunter’s Guide 2016: An Unofficial Player’s Guide Kindle eBook for free. That’s a $3 savings for this 24-page guide. Here’s something different for Pokémon players! This Pokémon Pokéball with Pokémon inside is on sale right now for only $7.99! It’s normally $19.99 and a great way to start collecting some fun memories of this craze! Pre-order this Pokewares Shield for Pokemon Go Plus for just $14.99! This STrATO Pokeman Go Ball Portable Charger PokeCharge LED Power Bank Pocket Monster Balls is too cute! Grab one while they last for $35.99 and up your style while you hunt! Are you searching endlessly for Pokémon on your bike? Cyclists (bikes and motorcycles) can score this Roam Co-Pilot Universal Bike Phone Mount for only $1.06 (or Black and Red for $11.98)!! This is compatible with iPhone 6/6s/Plus, 5/5s, Galaxy S4/S5S6 Edge and Note 5. Please be careful while hunting and riding! Running around as a trainer means you’re burning calories, too, so take advantage! Track your fitness levels and keep track of them with a new Fitbit Flex for just $79.99. Bud Light Party Convention – Pub Primaries Are In Dallas! Attention all Bud Light fans! If the political campaigns going on right now are getting a little too stressful for you, why not throw a little fun into the mix? The Bud Light Party Convention is hitting the campaign trail this Summer, and they are already in Dallas! The Bud Light Party Convention is a 13-city tour that will feature some hot musical talent, great fun, and of course, Bud Light. In fact, Jason Derulo and Brett Eldredge will be performing at this big event! The Pub Primaries have already begun, and will run through August 5th. If you want to attend, just hit one of the local venues below, between 5-8pm. You’ll be asked to cast a vote for one of three local charities: Habitat for Humanity, Resource Center and Folds of Honor. The winning candidate will score a campaign donation and recognition at the Convention. Dallas’ own JoJo Fletcher from “The Bachelorette” will also be attending this fun event at Klyde Warren Park on August 11th. Have your chance to meet her and join in on the fun! Earth Day is coming up on April 22nd and events are held worldwide to demonstrate support for our environment! Here is a list of Earth Day events and activities in North Texas. Here are 5 fun and easy at-home activities to do with your kiddos as a reminder to slow down and appreciate the bounty of our beautiful planet! Peanut Butter & Pine Cone Bird Feeder~ You only need 4 components: a pine cone, peanut butter, twine, and bird seed. First, tie twine to top of pine cone to use later to hang your bird feeder. Next, using a spoon or knife, spread a thick layer of peanut butter all over the pine cone. Then, roll it around in the seed, making sure to press the seeds into the peanut butter and hang in your favorite tree! Make Recycled Paper~ This slightly messy project requires some patience and preparation, but it’s not tricky and the process is worth exploring. Supplies- Screen, Large Tub, Washcloth/rag/burp cloth/large piece of felt, Water, Torn paper from newspaper, tissue paper, magazines, etc. and a Blender Steps– Shred the paper up into little pieces (roughly 2″ square). Add paper to the blender, cover it with water, and run the blender on a low speed. (add more water if the blender doesn’t move easily) Continue to run the blender a little bit faster until you get the paper mixture into a nice, smooth pulp and add more water if your pulp is still chunky. Spread the pulp in a thin and uniform layer across the screen and cover this with a rag or cloth diaper to absorb the extra water, while also pushing the water through the screen into the tub. Place one hand firmly on top of the cloth and then flip the screen over onto a work surface. Remove the screen and put the cloth plus paper pulp in a spot where it could dry, undisturbed, for about a day. The thicker the paper, the longer it will take to dry. Rainbow Scavenger Hunt~ Toddlers and preschoolers will a lot of fun playing this game that’s all about learning and searching for the colors of the rainbow. All you need is a camera and some time. To play, start with the color red. When your little one spots something red, snap a photo of it. Then look for something orange, and so on. Not only will they be learning the rainbow, but you’ll be tuning our eyes toward objects in your neighborhood and your local environment. Mud Pie Kitchen~ This is a favorite for little boys! Go through your kitchen or head to Goodwill to find cheap pots, pans and cooking utensils. Then set aside a place in your back yard garden to be the dirt pile and make an area for working on such as an old play table or unused plastic crates. Set up the hose or buckets of water near your new mud kitchen and let their creativity flow! Recycled Garden Collages~ Here’s a way to bring a beautiful garden indoors! Start by discussing things you might find outside like flowers, fences, bugs and more. Then collect cardboard food boxes, straws and lids to create a fun flower filled garden like the one pictured below! Kids Fishing at Bass Pro Saturdays, 11 AM Free Join Bass Pro each week when kids are welcome to fish on their pond. Go here for details. Located at 8084 Park Lane in Dallas, Bowl & Barrel offers a unique entertainment experience. The “boutique bowling” venue showcases a full-service restaurant, a modern American tavern featuring house-made specialties, a classic European beer hall and the all-around best adult bowling experience in the Metroplex. For more information, visit BowlAndBarrel.com. To kick off the new year and encourage people to enjoy the gardens and be outdoors, the Dallas Arboretum is offering $5 admission beginning January 4 and continuing through January 31 for non-members. Members receive complimentary admission year round. This offer is only available when purchased at the gate. Dallas Comic Con Fan Days returns to the Irving Convention CenterFeb. 13-14, 2016 with a hearty offering of everyone’s favorite comic artists, celebrity guests, and cosplay fun. Irving Convention Center is located at 500 W. Las Colinas Blvd., Irving, TX 75039. Show hours are Saturday from 10am to 7pm and Sunday from 10am to 5pm. Speed Dating is coming to Fan Days for the first time for a special Valentine’s Day weekend event. Want to find someone who geeks out on pop culture as much as you do? As a special Valentine gift for show attendees, this one-of-a-kind experience is free for attendees. Sign-up is on-site only, and men and women 19+ are eligible. Special LGBTQ sessions are also available. Will you find the love of your life among the universe of all things comics, movies and TV, sci-fi and anime? Why not create your own love story while enjoying all of your favorite stories? The Dallas Zoo is the only place you’ll find koalas in Texas and one of only 10 zoos in the nation with these cute creatures. When you adopt a koala, your Valentine gets all of the parental pride without all the work. We’ll handle the cleaning, feeding, and housing for the koalas. You’ll receive the satisfaction of knowing that your gift helps support animal care at the Zoo. The cost for this Aussi-some gift is $50 ($40 for DZS members). No charge if you pick it up at the zoo; shipping prices are additional cost. The temperature has dropped and so has the price of admission to only $5 for the entire month of February ($8 parking). Unconditional love is waiting for you at the PetSmart Charities National Adoption Weekend, Feb. 13-14. Whether you’re looking for a relaxed, cool cat or a youthful, energetic puppy, you’re bound to find the perfect match. Every pet that comes through the doors of the Fort Worth Animal Shelter has a story — often one of being abandoned. More than 20,000 animals land at the shelter each year. It’s the goal of the shelter to find loving a home for each of these incredible pets. Adoption fees are reduced to $10 during this event. The adoption fee includes an initial medical examination, rabies vaccination, city license, micro-chip and spay/neuter services. If you’ve been waiting for a discount on the Great Wolf Lodge – it’s back on Groupon! See all Great Wolf Lodge offers here – discounts available nationwide. Prices vary by location and the type of package that you select. For those of you in Dallas, here is a discount for the Great Wolf Lodge – Grapevine location. You can choose from FOUR options – as low as $149/night, with a one-night minimum. Here is a super great offer! Right now on Goldstar you can get select premium tickets for just $20 each! This includes the Dallas Mavericks, starting at just $16, Sesame Street Live and Rent! Go here for more information! Samuel Lynne Galleries is pleased to announce internationally renowned contemporary artist JD Miller’s annual Valentine’s Eve LIVE painting on February 13, 2016 from 5 – 8 pm. This year’s event will be even bigger than previous years as we move the engaging, one of a kind performance into our main gallery to incorporate a larger audience. Please also note that children are welcome, and we will have a special seating area for them at the front of the stage. Viewers will have the unique opportunity to witness Miller’s artistic vision at work as he utilizes color, texture, and shape to create a visual masterpiece before their eyes. Main Event Entertainment is offering guests the chance to suit up and play with $5 Super Bowling. Now through Feb. 26, guests can bowl for just $5 per person, per game all day on Sunday and Tuesdaythrough Friday, and on Monday from open to 4 p.m.
For Main Event locations, go here. Looking for something fun to do with the family this weekend? Michaels is hosting another Kids Club Event this Saturday, February 13th from 10am – 12pm. The cost is $2 and all the supplies will be provided to make a Valentine Dreamcatcher. How fun! Choose a chocolate for the chance to win a Date Night Package, a $100 Helzberg Diamonds Gift Card, or the Grand Prize 3/4 Carat Teardrop Diamond Pendant! We hope you will join us this Saturday in any of the following locations: Omaha, Kansas City and Texas event center. $25 per child includes 8×8 LOVE canvas, Crafting Valentines, Decorating Cookies. Registration is now OPEN for the upcoming Lowe’s Kids Clinic! On Saturday, February 13th at 10AM, head into Lowe’s where kids can build a FREE Valentine’s Day Picture Frame! Be sure to register your kiddos now as spots tend to fill up quickly! If you’ve never attended one of these free Kid’s Clinics, check out my previous experience here. Bring the whole family for a Valentine’s Day celebration at NorthPark Center. Enjoy a chamber concert of love songs from the Dallas Symphony Orchestra, engaging crafts for the kids, cookie decorating with Green House Market, children’s entertainment from Bookmarks and more. From February 1 through April 1, with the purchase of one adult ticket and donation of five empty soda cans receive one free kids admission to SEA LIFE Grapevine. Bring in five cans for each additional child ages 3-12 and their ticket is just $5. * *Beverage cans must be non-alcoholic. Children ages two and under are free. Only available for purchase onsite. Lots of great movies still to come over the next few weeks! Right now, go here where you can pay $5.00 for a movie ticket at Studio Movie Grill! This Saturday, 2/6, Studio Movie Grill will host a Special Needs Screening of Kung Fu Panda 3 at 11am! Tickets available at the box office only. Special Needs screenings are free for children with special needs and their siblings. Everyone else pays before noon matinee price. Special Needs screenings run with the lights up and the sound down so the children are free to laugh, play, sing and even dance while they watch. Seating will be first come, first served. Legacy ER & Urgent Care in Keller is having a grand opening celebration on October 31st with lots of giveaways, fun events and $10 flu shots! This latest opening joins locations in Coppell, Frisco, McKinney and North Richland Hills, making it the nation’s largest stand-alone provider to offer both urgent care and emergency room services under one roof. Patients have access to immediate, on-site emergency room equipment and only pay emergency care prices when it is truly an emergency. Appointments are not necessary, and online check-in means you can even bypass paperwork when you get here. Most patients wait less than 5 minutes to see the doctor and are typically heading home in under 30 minutes. Plus you get the Hybrid Billing Model accepting both Urgent Care and Emergency Care co‐pays. In celebration of the new locations, Legacy ER & Urgent Care is offering $10 flu shots in all the communities it serves. Flu shots are usually covered under health insurance, and they can check that for you when you come in. If you’re covered, then the shot is free; but if you don’t have insurance or your insurance doesn’t cover you 100 percent, then this may be a good option for you! When: Saturday, October 31, 2015 11:00 a.m.-3:00 p.m.
Costume contest at 2:00 p.m. There are so many Fall festivals in the DFW area that you could hop around the metroplex every weekend through the end of October if you wanted to! Most of these are pretty budget friendly (some are FREE!) but check out the individual websites for more information on each event. As a new feature on MyDFWMommy, we are going to put the spotlight on the suburbs of our great Metroplex! We’ll take one city and break down all it has to offer! For this installment, we will talk about things to do in Frisco, TX. Frisco was the fastest-growing city in the nation from 2000 to 2009 and is home to FC Dallas, the Texas Legends and the Frisco Roughriders! Here’s a summary of our must see places and activities that happen in this hip, family friendly town! Arts In The Square~ This event usually takes place in the spring and features over 120 of some of the best local and regional artists selling their handmade creations. Feast your eyes on incredible art, sit and relax by Simpson Plaza, listen to local musicians, watch ongoing performing arts and treat yourself to the food and spirits available at the variety of award-winning restaurants on site. Frisco StrEATS Food Truck & Music Festival~ Enjoy music and awesome food truck grub during this annual spring event that takes place in downtown! Frisco Freedom Fest~ This is your once-in-a-year chance to celebrate our nation’s birthday with fantastic food, great music and aaahhh-worthy fireworks! Plus, you can usually catch an FC Dallas game at the same time! Trick or Treat at Frisco Fire Safety Town~ Every October, they invite all ghosts and goblins from tots-5th grade to join the annual Fall Festival with Trick-or-Treating. This adorable village is decorated with fun and kid friendly Halloween tricks and the Safety Town residents pass out treats. Christmas in the Square~ This huge event draws over than 665,000 visitors annually to enjoy the spectacular show. Holiday lights and music unlike anything you have ever seen here in Texas- they even use snow machines by Disney to create a “Winter Wonderland” on the sidewalks! Experience on Fridays and Saturdays in December. Museum of the American Railroad~ Recently relocated from Dallas’ Fair Park, the Museum of the American Railroad displays its collection of over 40 pieces of railroad rolling stock and historic structures- very popular with the little boys! Central Park~ Cattle sculptures, waterfalls and native Texas landscaping offer a perfect setting for walking, picnics and biking in this beautiful native landscape. Texas Sculpture Garden & International Art~ You’ll find the largest private collection of Texas sculptures on public display without a charge. Forty large-scale pieces, all owned by Craig Hall, are featured in the sculpture park with an additional 100 pieces of artwork presented in and around the Office Park. Heritage Museum~ A living monument that collects, preserves and recreates the history of Frisco while showcasing the ageless artifacts and objects that hold many stories of life long ago in a western railroad town and some of the traditions that have endured over the years. The interactive museum featuring hands-on exhibits will allow visitors to understand how the early citizens of Frisco lived, worked, and played. A living village has been recreated with replicas of the Lebanon Baptist Church, a one room school house, a log cabin, the Smith Muse house, and the Frisco Train Depot. Hope Park in Frisco Commons~ Imagine a playground built to suit the needs of all kids, at any age, with a focused consideration for children with special needs! Pack a picnic lunch and plan to stay the day because your kiddos won’t want to leave! Platia Greek Kouzina~ If you like Mediterranean food, try this casual BYOB eatery for traditional Greek fare in a cozy space with authentic stone-&-brick-courtyard decor. Be sure to try the desserts! MASH’D~ This is my favorite spot in Frisco with a very ecclectic menu- perfect for a date night. Try the Pot of Goat appetizer, and for sure, the Moonshine in whatever flavor you fancy! 5th Street Cafe~ This is a great local spot on downtown to have a weekend breakfast or brunch- think Bananas Foster French Toast! NOLA Grill~ If you are in the mood for some Creole or Cajun food, the chef of NOLA Nick Totten, trained under Emeril Lagasse! Feast on Duck Gumbo and Fried Green Tomatoes before you try the New Orleans Bread Pudding- yum! 3 Stacks Smoke & Tap House~ You may know pitmaster Trace “The Rib Whisperer” Arnold from History Channel’s “Cross-Country Cookout” and even though he has fans in every corner of the nation, he settled down just a bit to create 3 Stacks Smoke & Taphouse. The namesake of the restaurant is attributed to the three large smokers that welcome you at the front door, each dedicated to a different selection of meat. Several of the Easter Egg hunts have already come and gone. But there are still some this weekend for you to take advantage of! Happy Easter! Hop on over to the CAC in Flower Mound on April 4th for the Underwater Egg Hunt! Egg-citing activities include a visit with the Easter Bunny, arts and crafts, and games. Stay around after the egg hunt to play in the pool and enjoy other activities. Parents must be in the water with all non-swimmers. Pre-registration is required. Come experience Easter in true Texas style! Easter egg hunt for all ages begins at noon sharp, and afterwards there will be an Easter bunny, face painting, a balloon animal maker and more.The hunt accommodates children through age 12. After the hunt, bring children ages 12 and up to the Stockyards Stables for the Hunt for the Golden Horseshoe! 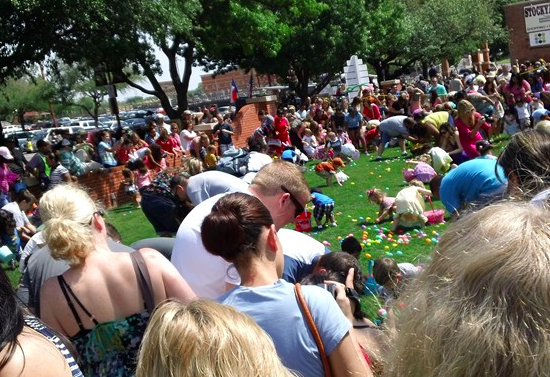 On Saturday, April 4, Elevate Life will kick off their FREE Easter festivities with one of the largest Easter egg hunts in North Texas at 11 a.m. sharp. Children up to the age of 12 will be gathering more than 75,000 candy-filled eggs scattered across Elevate Life’s lawns. Elevate Life only asks that children bring their own Easter baskets. Make sure to bring your cameras, because the Easter Bunny will be in attendance and available for pictures. Easter fun is not just for the kids – from 10 a.m. – 2 p.m. there will be a full class car, truck and cycle show in the parking lot. Everything from exotic, vintage and unique will be on-site. If you would like to enter your vehicle in the show, please visit Mustang Sally Productions. Some of DFW’s finest food trucks will also be available throughout the day. Immediately following the Easter egg hunt, Elevate Life Church will be aiming to create the World’s Largest Human Easter Egg by assembling guests in the shape of an Easter egg and taking a photo from above with a drone camera. You can join Elevate Life this Easter season at 8500 Teel Parkway in Frisco, Texas and can find out more information by visiting www.elevatelife.com, following Elevate Life on Facebook and Twitter or by calling 214.387.9833. Eligible Ages: 0-10 years old. A special needs accessible hunt will also be held. Center, 5151 North Colony Blvd. Hunts will begin at 6:45pm. Late arrivers are not guaranteed participation. Both events are free to attend and for children 12 and under. Explore the wonderful world of perennials and learn to create a garden that has interesting, beautiful plants blooming in every season! The experts at Calloway’s will guide you through planning, garden prep, and care of the most beautiful perennials for Texas! Head to your local Calloway’s this Saturday at 10:15am to a FREE seminar to learn which perennials will thrive in your garden, and discover the newest varieties and care techniques. Do you want to know where to get Easter Photos & Bluebonnet photos in Dallas? A must see is Texas Tulips. I had never heard of them before, but upon further investigation it is an AMAZING place for photos especially during Easter. March and April are the best times to visit and it is free! They are open from February 20th-April 20th from dawn to dusk. They have a hay maze and tulips you can pick and take home (assuming there is a cost involved here). Regardless, as you can see…GREAT photo opportunities and fun for the whole family. If you are looking for Bluebonnets… I found Bluenonnet Sightings, to be a great resource. I would be sure and check out their social media outlets too as people share where they are finding bluebonnets. Wildflowers have been known to run wild along Legacy Drive and the Dallas North Tollway. This is near the JCPenney headquarters in Plano, TX. Located in East Dallas, this 66-acre botanical garden offers photographers the opportunity to capture images of flowers, trees, sculptures, and nearby White Rock Lake. Many people enjoy visiting the arboretum in the spring and summer because the floral displays are so gorgeous. Fall is also a fun time to visit the arboretum! During the autumn season, the gardens are decorated with 50,000 pumpkins, gourds, and squash. One of the best locations to shoot the Dallas Skyline is from the popular Trinity River Levee location. Here is a map to the parking location. Want other options? This is an excellent list of more locations to shoot in the area. Please share your favorite places and we will add to the list!